If you are heading overseas via Changi Airport Terminal 4, my advice to you is please check-in at least TWO hours before your departure time. All because of this newest addition. 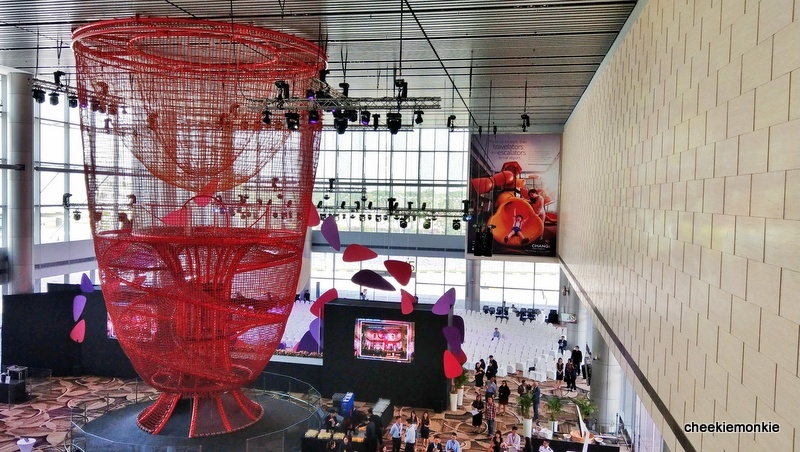 Kids - and the young-at-heart - can enter the structure via the sloping climbing nets that spiral all the way to the top. At the top (it's at a 5-storey height by the way), you can choose to enter a semi-dome rope structure just to watch the world go by. Although I'm inclined to believe that kids cannot resist jumping and climbing up the rope structure! LOL. FUN FACT: The playground doubles up as an art sclupture too so it was decided that ropes were to be used for the structure so as to achieve the 'transparency' effect and yet inject an element of adventure, which is synonymous with travel. So there you have it, the towering Chandelier which is made of some 10 kilometres of rope and supported by 15 tonnes of steel. Anchored to the both the ceiling and the ground, it can admit up to 50 persons at a go. It is located in the TRANSIT AREA of Changi Airport T4. Which means you have to catch a flight out of Singapore from Terminal 4 in order to access it. *The Chandelier opens in September 2018, and has a height requirement of 1.1 metres.